16586 ND PHILIPPINES (1978) Child receiving smallpox vaccine*. Imperforate pair. 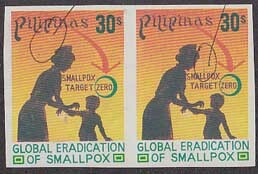 Global eradication of smallpox. Scott No 1366, Yvert No 1075. 16588 ND PHILIPPINES (1979) Man breaking chains*. Syringe*. Imperforate corner block of 6. 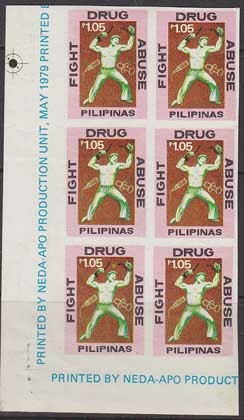 Fighting Drug Abuse. Scott No 1424, Yvert No 1152. Two small staple holes in selvage.